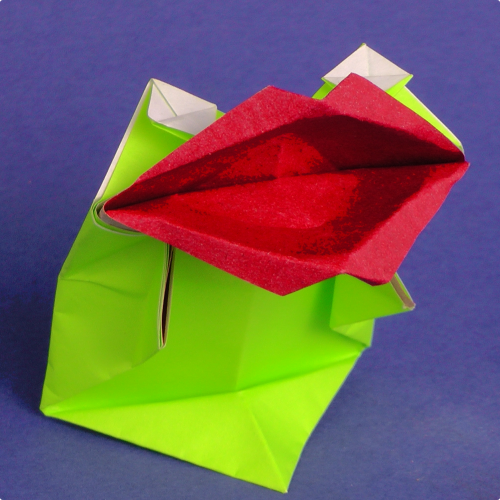 Follow the tutorial video below to learn how to make your own Kissing frog. You can use any quadratic sheet of paper. This model really does not ask for any special paper. I use 15cm Kami in the Video. You can get the paper here(affiliate link). For best results use one green sheet and red sheet. Cut the red sheet in four smaller sqaures. So you can have a frog with with white eyes read lips and a green body. This action origami can easily be used to illustrate the famous fairytale of the frog prince. I had great success with teaching it to kindergarden children. Kids just love origami that moves! By folding one frog without lips to the one with lips one can achieve the effect of having a male and a female frog origami. The kissing frogs make great origami puppets.